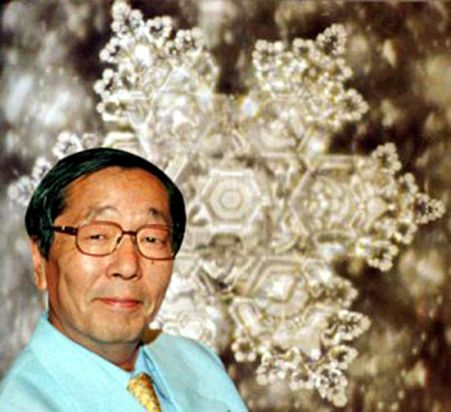 In 1994, scientist Masaru Emoto decided to freeze water and to observe the molecules under a microscope. With this method he was convinced that he could see something like snow crystals. After two months of trial and error, this idea bore fruit. The beautifully shining hexagonal crystals were created from the invisible world. Mr Emoto and his laboratory staff were absorbed in it and began to do many researches. At first, they strenuously observed crystals of tap water, river water, and lake water. From the tap water they could not get any beautiful crystals. They could not get any beautiful ones from rivers and lakes near big cities, either. However, from the water from rivers and lakes where water is kept pristine from development, they could observe beautiful crystals with each one having its own uniqueness. The result was that we always observed beautiful crystals after giving good words, playing good music, and showing, playing, or offering pure prayer to water. On the other hand, we observed disfigured crystals in the opposite situation. Moreover, we never observed identical crystals. I published these results as photograph collections. This is what the water molecules looked like before and after the tests. This is what the molecules looked like after saying the following positive words. This is what the water molecules looked like after saying the following negative words. This is the most well known and reproduced experiment they did. 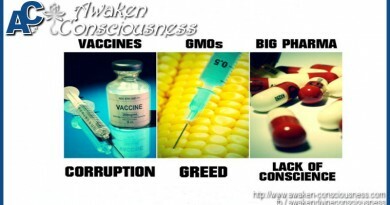 In the following experiment, they took 3 jars and filled them with rise. 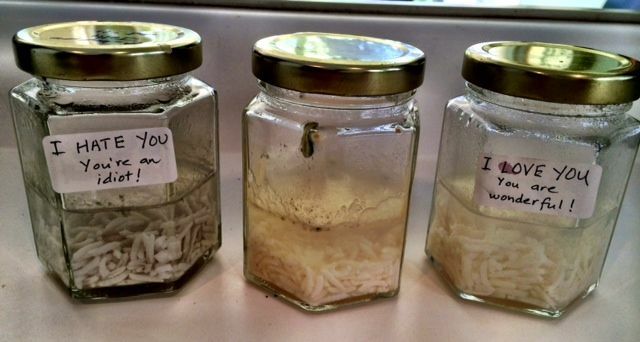 To one jar they said “I love you, you are wonderful”, to the second jar they said “I hate you, you’re an idiot” and to the third jar they said nothing. After 30 days, the jar they said I love you to was still looking healthy. The jar they said nothing To did not look that good anymore, but the jar they said “I hate you” to, turned really bad. Our responsibility when we produce words or sounds. 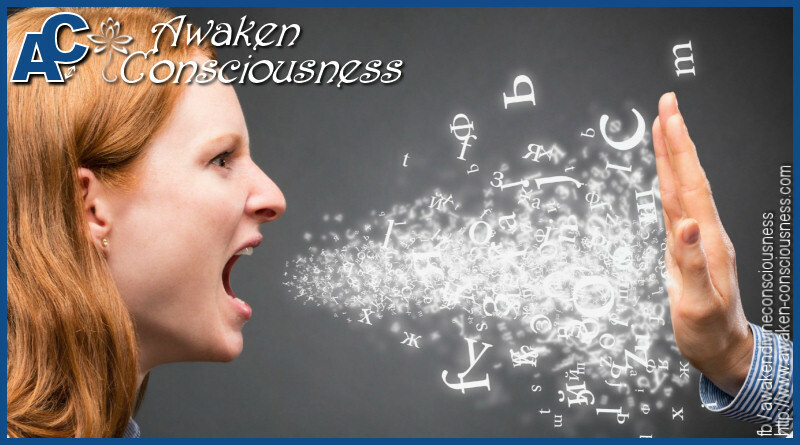 The conclusion we can make after these experiments is that the words we speak have a profound effect on our surroundings, water, food and since the human body consists of +/- 70% of water, ultimately also on each other. After these experiments it should be clear that we hold a big responsibility when we talk and produce words or sounds. Even more when we direct those words at someone. You can make someone feel good and even heal them by saying nice, loving words to them and sending them good intentions. But you can also make someone feel very bad and even make them sick by saying negative things to them or calling them names, sending them bad emotions that will have an effect on a person on a quantum level. This is what empaths are so sensitive to, they pick up peoples emotions easily, good and bad. 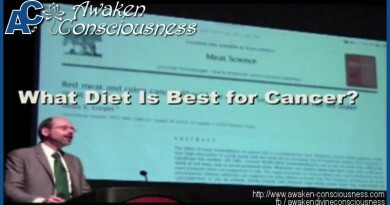 ← GENES DON’T CONTROL OUR AGING!